There was concern about describing PM as 'semi-detached' on estate agency billboard. 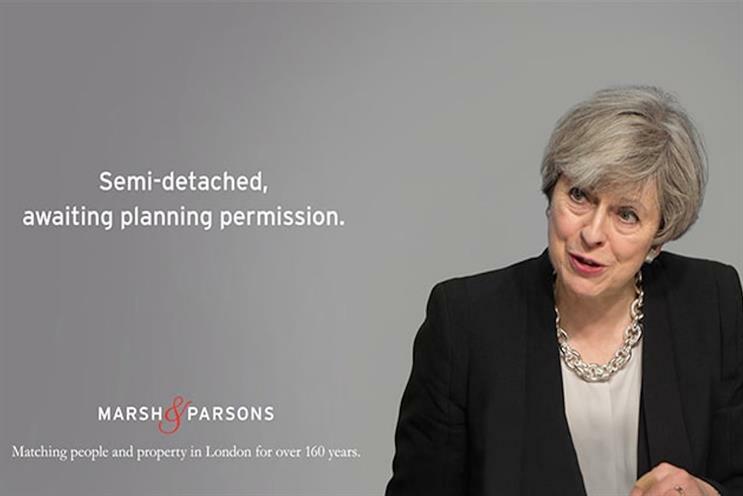 Estate agent Marsh & Parsons has had an outdoor ad pulled one day after launch due to fears that it portrayed prime minister Theresa May in a negative light without her permission. It is the latest in a series of comic ads for Marsh & Parsons that juxtapose descriptions of property with images of people. It was created by Steve Stretton, formerly of Archibald Ingall Stretton, with an agency called Addmustard handling the digital marketing aspects and MC&C handling media planning and buying. According to Property Industry Eye the Committee of Advertising Practice advised JCDecaux that ads "must not unfairly portray or refer to anyone in an adverse way unless that person has given the marketer permission to allow it". This is an almost accurate quote from Rule 6.1 of the CAP code, which actually specifies the permission should be in writing. In addition the rule also says that "marketers are urged to obtain written permission before referring to a person with a public profile". The code covers advertising in non-broadcast media and direct and promotional marketing. A spokesperson for Marsh & Parsons said: "We note that the advert has been withdrawn following a decision made by JCDecaux." Addmustard chairman and MD Lawrence Hunt told Campaign the overall campaign had performed "massively well" and the latest ad had received "a lot of attention". Hunt added that Marsh & Parsons has pulled the ad from all media, which Campaign is seeking to clarify with Marsh & Parsons. Robin Trust, CEO of MC&C Media, told Campaign: "It’s disappointing the ad got pulled so quickly because we know from experience that the public love Marsh and Parsons' reactionary style of advertising and, as far as we’re aware, there have been no public complaints. Nor is it the first piece of creative work to target a public figure who is central to a high profile and newsworthy story. "The same ad ran in the Evening Standard this week, and is scheduled to run in Time Out next week. Either way we can’t complain about the significant media value created by the buzz around this ad, especially as I don’t anticipate the perceived criticism harming the brand in any way." JCDecaux has not commented. Its apparent wariness about upsetting the PM bears echoes of its decision last month not to carry ads from the anti-Brexit campaign group Led By Donkeys because they were "too political". A spokesman for CAP said he could not confirm what advice it gave to JCDecaux because it will have been given in confidence.